A fireplace is the heart of the home. It is the centerpiece where family and friends sit and are together. But the mantel can be a challenging piece to decorate. 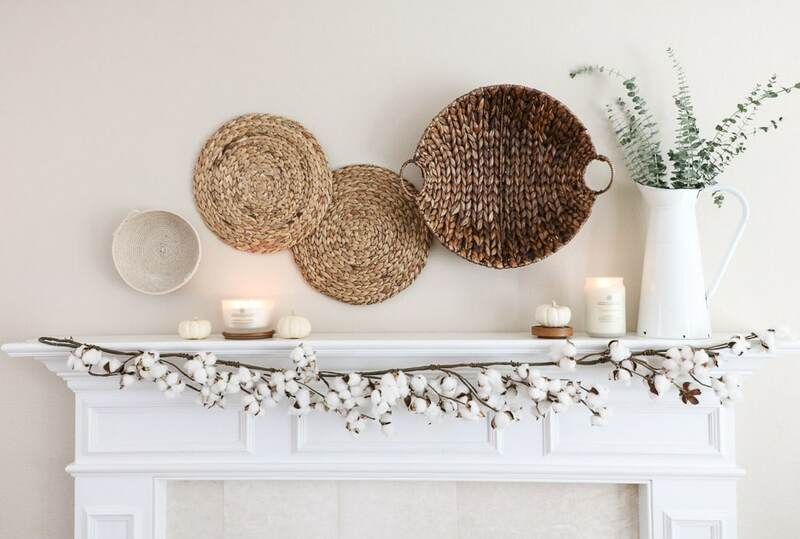 Today we are bringing you a DIY fall decor mantel idea using baskets and candles from the Heritage Collection by Chesapeake Bay Candles. 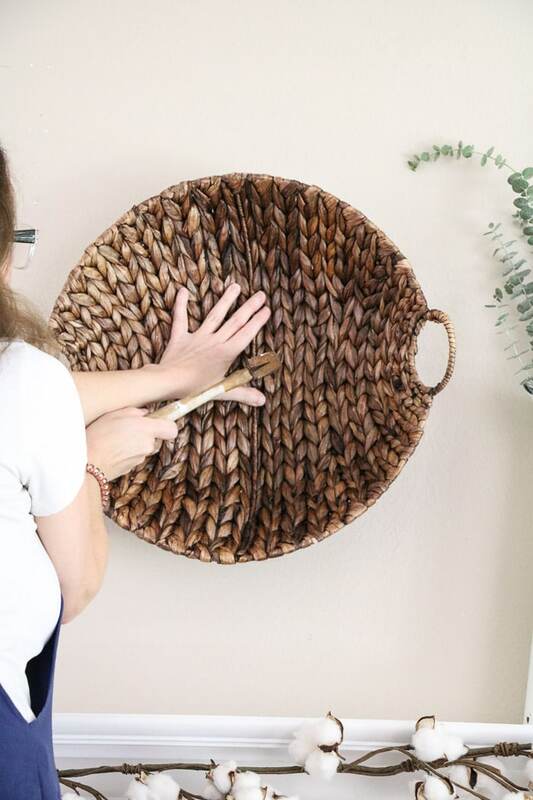 And a tutorial on how to hang baskets on a wall. 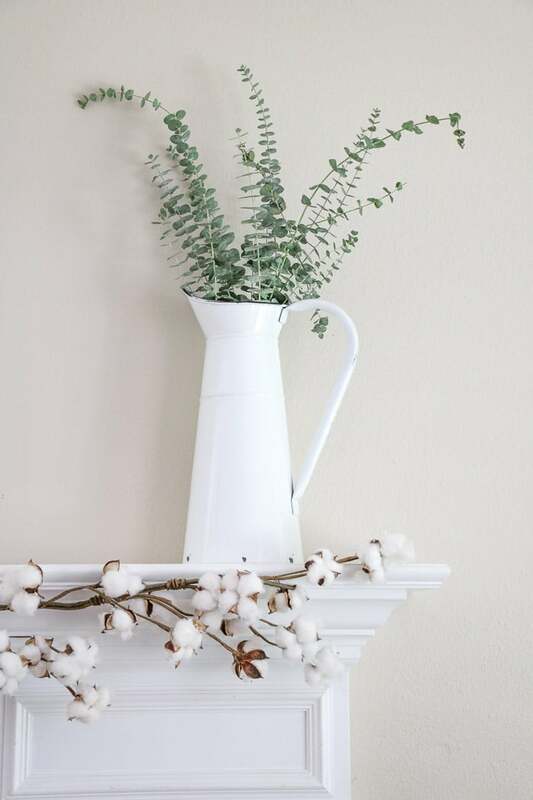 A mantel is a great place to change up your decor for the seasons. This DIY fall decor fireplace mantel is so easy to create. Thank you Chesapeake Bay Candle for sponsoring this post. All opinions are my own. Okay, so we know mantels can be tricky. But that’s okay because there are two things you need to consider when accessorizing your mantel. A-symmetry and symmetry. 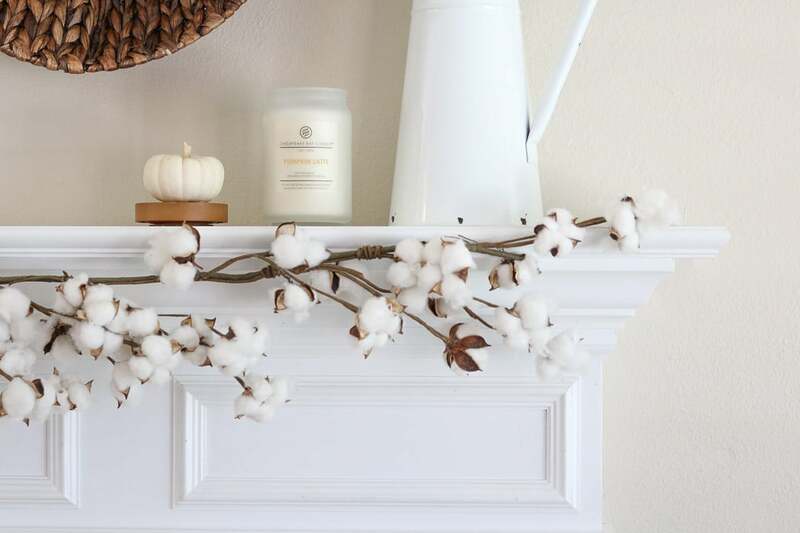 The DIY fall decor mantel in this post is asymmetrical. That means it is not perfectly balanced on each side. So, this particular mantle is super easy to recreate. 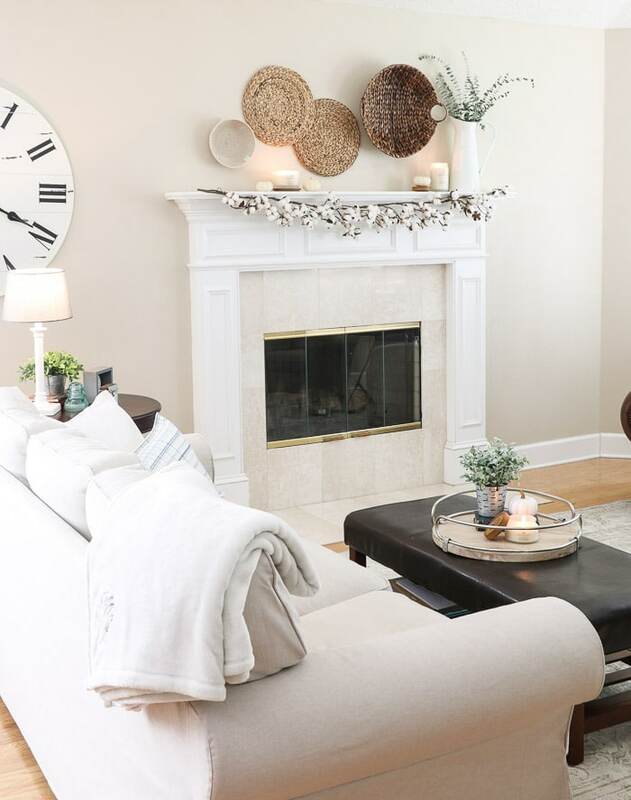 Before you begin your mantel creation look for some inspiration. I have several fall decor post filled with beautiful farmhouse fall decorating ideas. 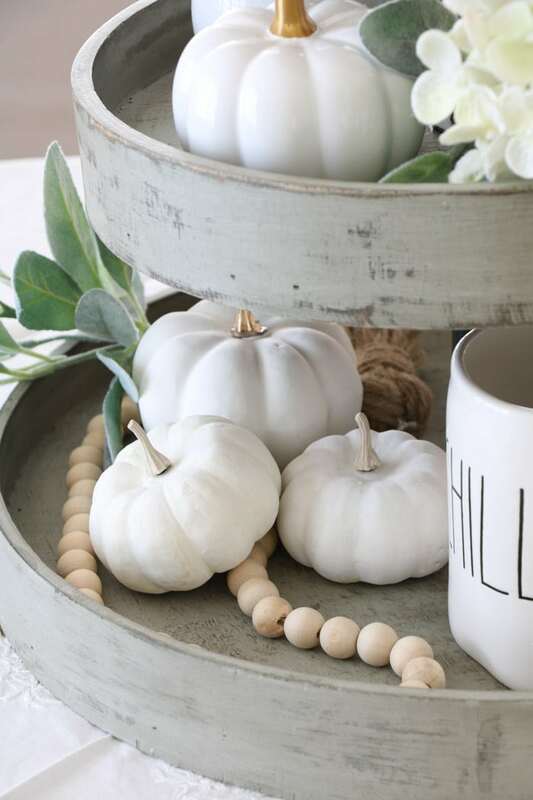 One is the Fall Tiered Trays post, and the other is Using Small Pumpkins in Decor. Here is a photo from one of the inspiration posts. 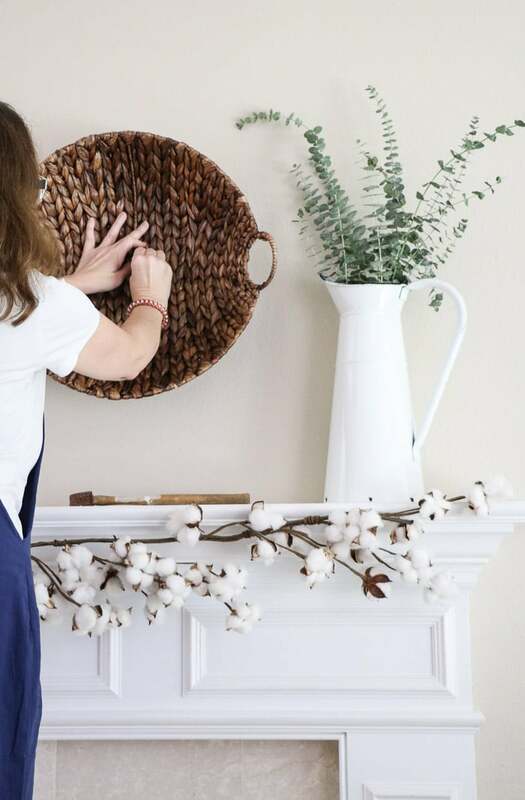 These are the tools you will need to create a DIY Fall Decor mantel. Before you start hanging your baskets place the tallest fixture on one end of the mantel. Placing the tallest item will help you when you begin hanging the baskets because it gives you a natural starting position. Now on to hanging the baskets. 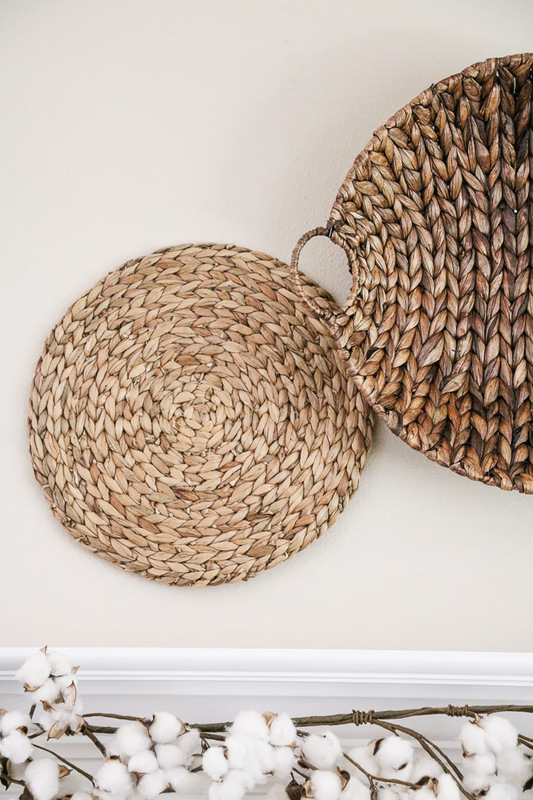 Start with pulling out supplies to hang your baskets. Sit your hammer and nails on the mantel. And place the baskets within reaching distance. Once you are on the ladder, it will save you time and energy to have all your items within reach. Before you begin hanging your baskets lay them out on the floor to determine how you want the layout. 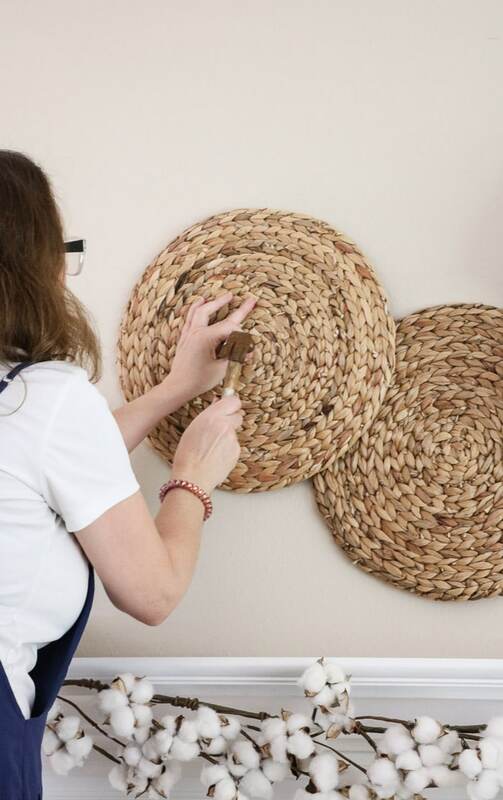 Once you have the design planned then determine the position of the first basket on the wall. Next, find a tight spot in between the weave and manipulate the nail through the hole. Now hammer it in leaving a little extra in case the basket decides to lean out some from the wall. 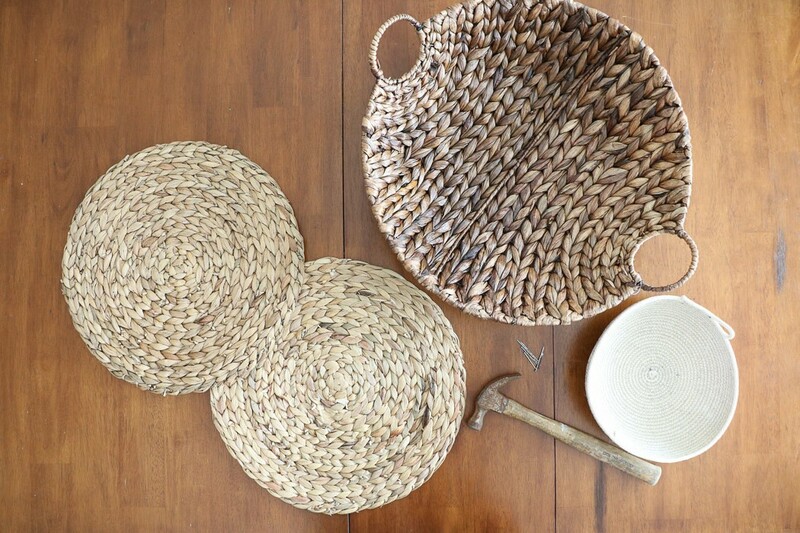 If your basket is curved and not flat, you will need to add more than one nail to hold it into place. I used three nails for the first basket. Okay, so we have the first basket on the wall let’s move on to the next basket. The next step becomes more natural because it is a repeat of the first hanging basket. But consider having someone close by to help you position the baskets. 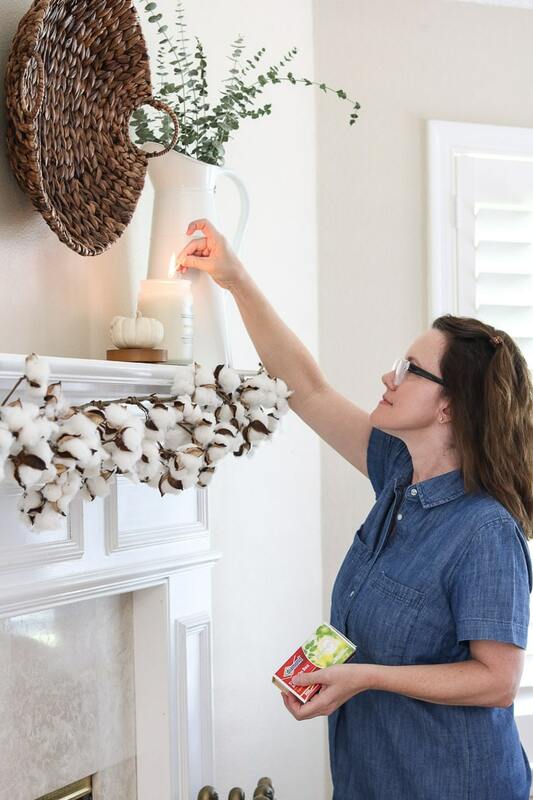 Have them stand perfectly center with the fireplace and direct you to the left or right as you hold the second basket on the wall. My second basket is a placemat. It was the perfect size smaller than the first one. 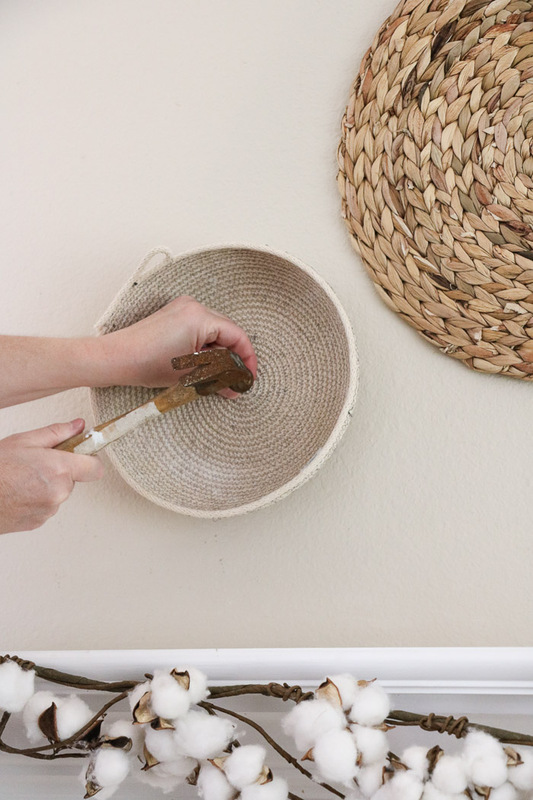 See how easy it is to hang a basket? Continue adding baskets. I added another placemat for repetition. And then ended my basket hanging with a small lighter colored one, so all my baskets have a range of tones from medium dark to light. Hanging the baskets took about 20 minutes with help. This project is coming together and getting exciting! 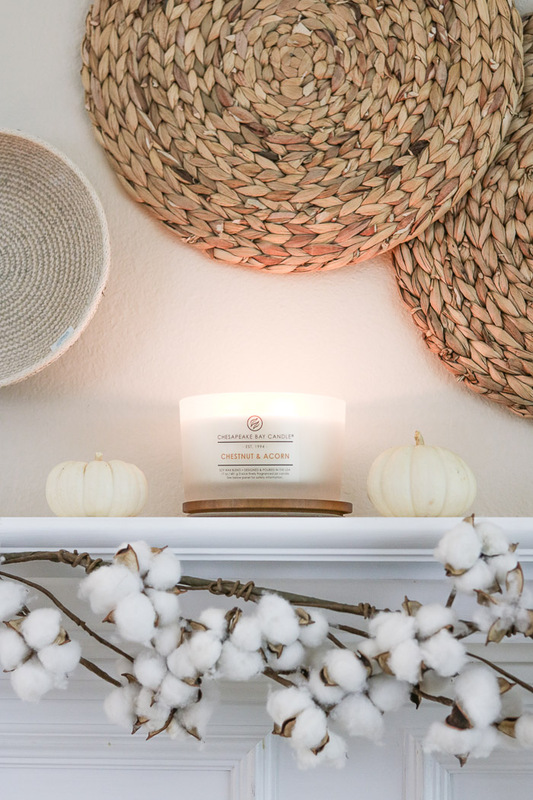 So, now it is time to add that DIY fall mantel decor and what a better way than with some festive scents like these candles from Chesapeake Bay Candle company and small pumpkins. I started adding accessories working from the right where the tallest prop is to the left. 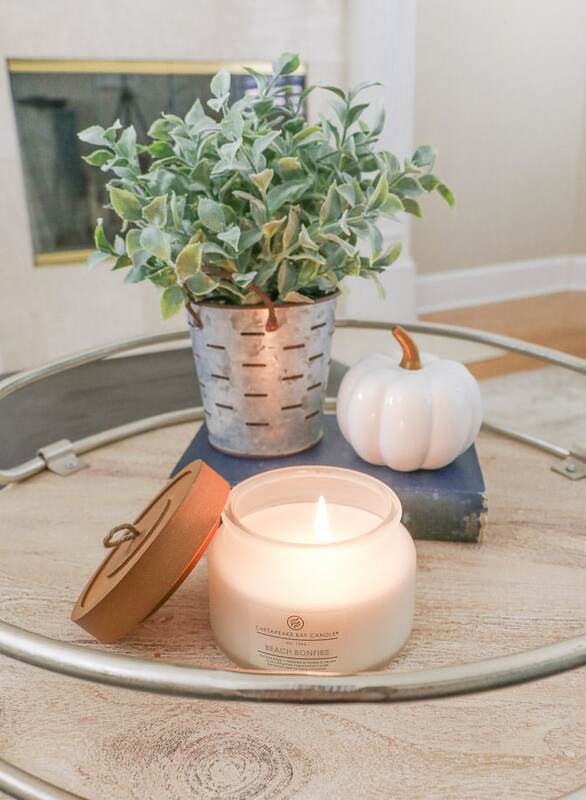 Place a lower item like this Pumpkin Latte candle and then a small pumpkin next to it. I particularly like Chesapeake Bay candles because they use essential oils. I feel it is essential to think about what you are putting in the air of your home. That is why these candles are excellent choices! If you have a pretty lid like this wooden design consider placing it under your pumpkin to give it some more height. Another thing I LOVE about this candle brand is the layers of scents. Pumpkin Latte’s top layer is praline, pecan, and pumpkin frosting. The middle layer is pumpkin pie and brown sugar. And the bottom layer is caramel, maple butter, and creamy vanilla. Oh boy! Talk about dreamy! Now let’s move on to more fall decorations. Consider adding another candle that also has a festive scent like this Chestnut and Acorn candle by the Chesapeake Bay candle company. Remember me sharing about the layers in pumpkin latte? Well, wait until you see what flavors are bursting from this candle. The top layer is cinnamon and chestnut. The middle layer is brown sugar pecans, nutmeg, and walnut. And the bottom later is clove, vanilla butter, cedarwood, and maple. Now add two more pumpkins to polish the look. If you are a lover of garlands like me then consider adding a cotton garland for another texture and autumn vibe. Simply drape it across the mantel with small thin nails on each end. 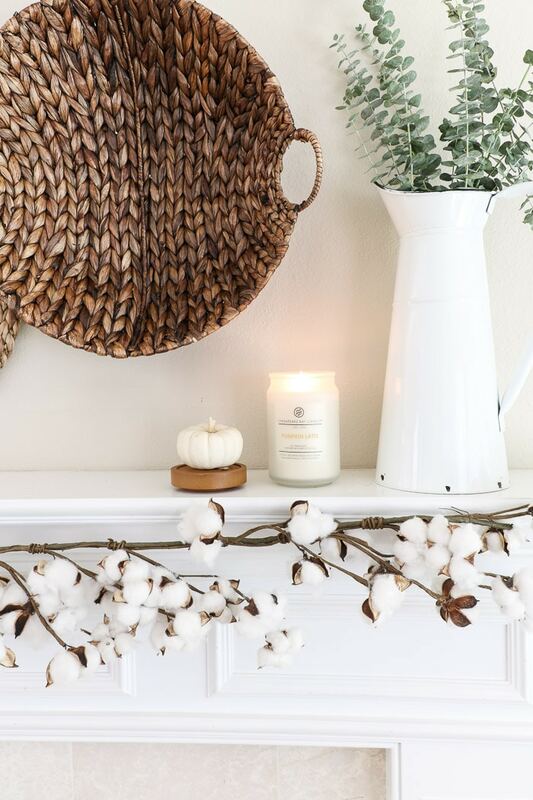 Now that you have these exquisite candles, pumpkins and cotton garland placed like magic, your DIY fall mantle is finished. 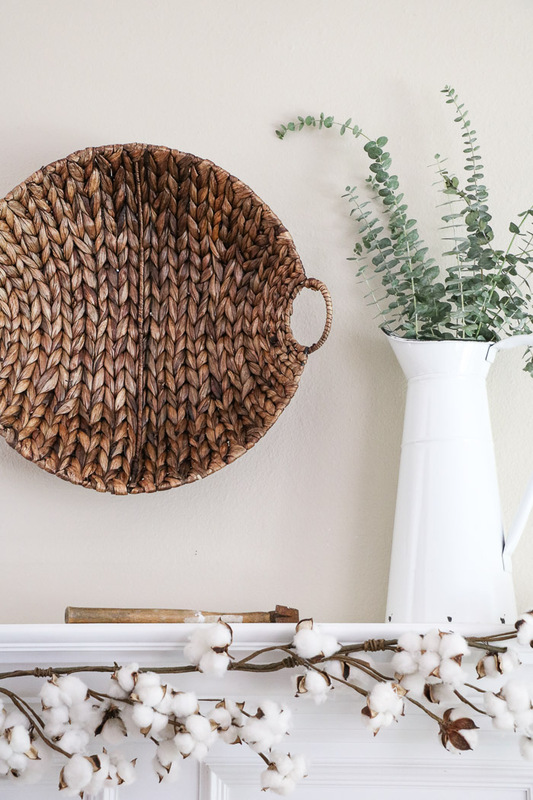 This DIY Fall mantel is super easy to create. And if you are a lover of minimalist designs then this mantel is your ticket. 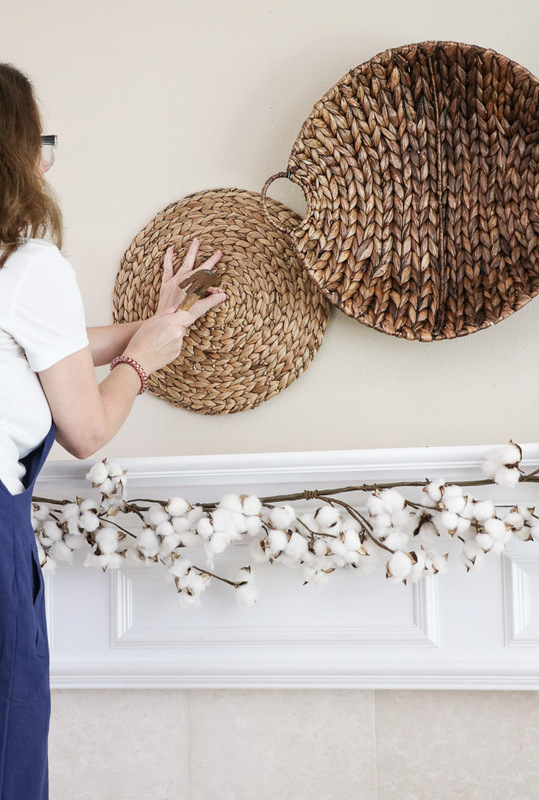 Now that you know how to hang baskets on the wall and how to add that fall feeling with Chesapeake Bay candles and pumpkins you can add more fall decor items all over your house. Like we did on our ottoman tray. To repeat the mantel design, we added another pumpkin and Chesapeake Bay Candle, called Beach Bonfire. This gave the room a beautiful glow with all the candles. The Beach Bonfire candle delightful layers are the top aromatic, leather, eucalyptus. The middle layer is fire needle, black pepper, and nutmeg. And the bottom layer is cedarwood, oakmoss, and musk. Overall, this candle has a woody fragrance. I hope you have enjoyed and learned more about how to style a mantel for the fall season. 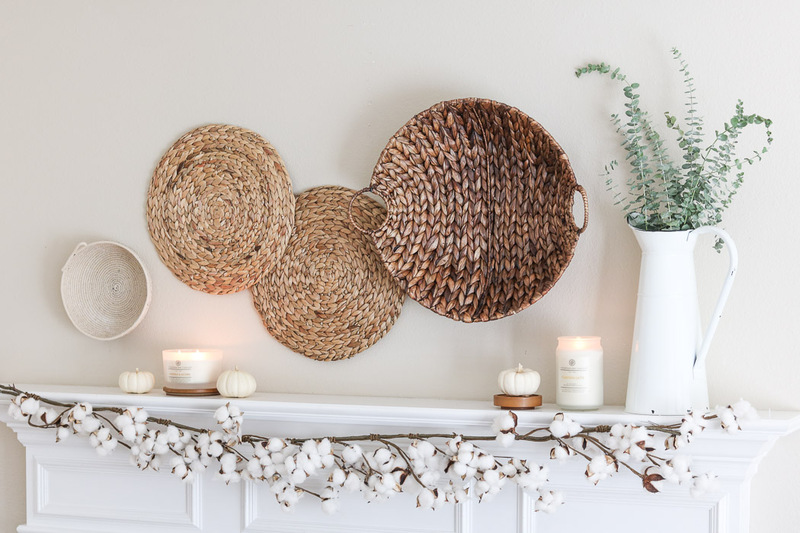 Whether fall comes early or late in your neck of the woods a design using baskets and autumn candles will help cozy your space for the season. That is so pretty!! I love those baskets and those candles are gorgeous! Thank you! I was fun to create. The fragrances of the candles sound really yummy. Different heights makes an arrangement work! Love this almost enough to paint my fireplace white. I love your decor, Linda. Though I still have the traditional fall colors in my home, I admit I love the calm created by the more neutral fall decors that have become so popular this year. 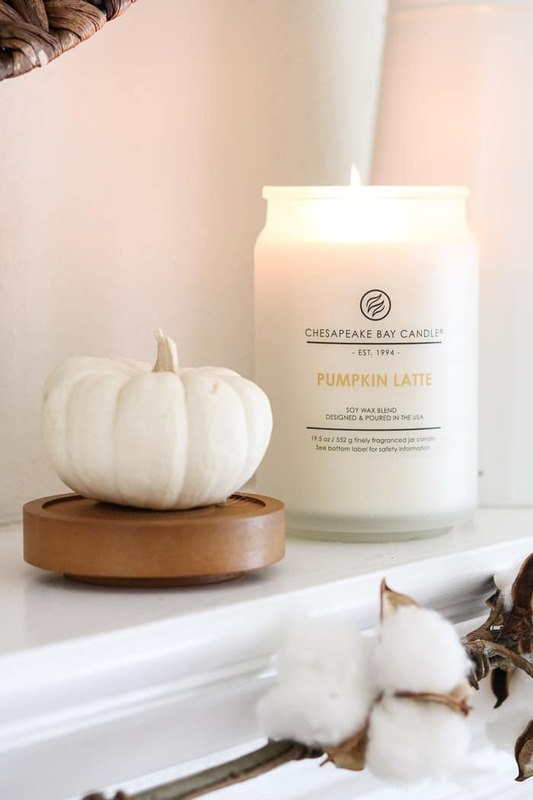 And your description of that pumpkin latte candle, oh my! I need to get a hold of that one! Thanks for the tips! Thank you for your kind words! The neutral colors are more calming and match most home decor easily. I hope you get the candle. You can order it online by clicking on my links or they have them at Target. Happy Fall!